Iron Maiden’s “Fear Of The Dark” has been covered by the Harp Twins. 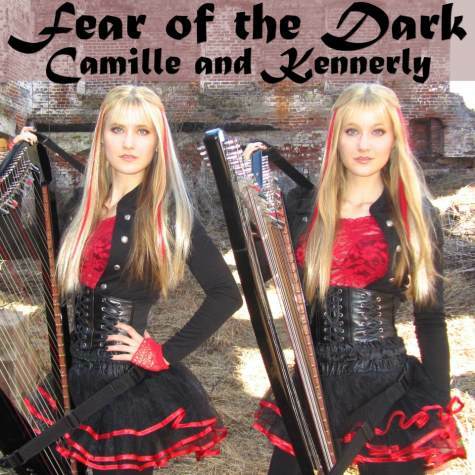 Camille and Kennerly Kitt have released their version of the Maiden track as an electric duet harp arrangement. "Audio recording = No studio or sound engineer. No splices, edits, loops, overlays, or backtracks. Just two harps — one audio take!" posted the duo. Known as the "harp twins," Camille and Kennerly perform internationally as a dynamic acoustic and electric rock harp duo. As the world's only known identical twin professional harpists, Camille and Kennerly have a passion and flair for arranging and performing contemporary music for harp duet. Camille and Kennerly are known for their remarkable duet harp arrangements of songs by artists such as Guns N’ Roses, Led Zeppelin, Metallica, Aerosmith, AC/DC, Deep Purple and many more. The twins also arrange and perform a jukebox of Broadway, video game, TV and movie soundtrack hits. In addition to being prolific arrangers, the pair compose and perform their own original pieces for harp duet. Camille and Kennerly began posting harp duet music videos of their rock-pop cover arrangements on YouTube several years ago. The twins have since acquired over 6.3 million total views on their videos in addition to amassing a large worldwide following of their music. Learn more about the Harp Twins here.